I've read several articles on home trend predictions for 2018 and in my opinion some of them are just plain odd. Yellow is coming back? Was it ever in, or even out? Maybe these are very high end designs we won't see for several years. I decided to weigh in on new trends I am seeing from some of my favorite designers. White and gray has been king for several years. You know I'm a fan! That doesn't mean you have to completely get rid of your decor and start over. Fresh, light and bright is still in! You're not going to see a return of heavy, dark interiors this year. I believe colors will be more layered. I have been slowly adding blue and caramel/brown to my living room to warm it up. I'm also seeing a return of more color. When I say color most people flinch because they are picturing primary colors. Adding just a small third color to your room can give it so much depth. I did this in my own room by adding a pop of pink through an orchid arrangement on my coffee table. Don't listen to the old advice that color must be repeated. Sometimes all you need is that tiny pop of color from flowers, a small pillow, or a vase. 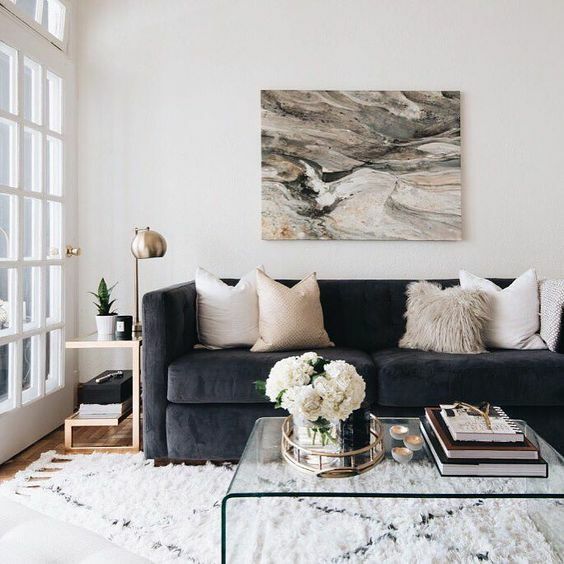 Even a room that is considered neutral at first glance may have several variations of color (not to mention texture) when studied in more detail to add interest. The result is rooms may appear neutral, but they aren't going to be as flat. Regardless of style, everything is moving more contemporary. 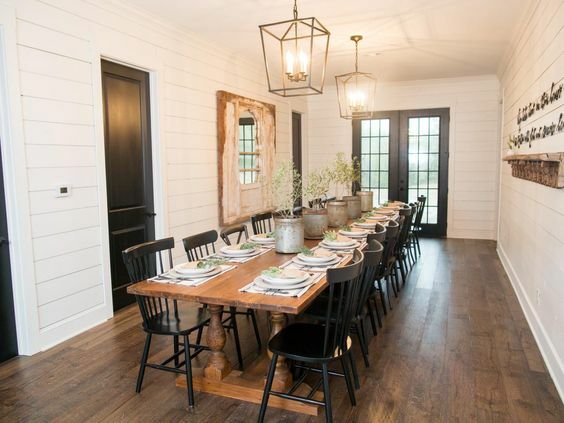 If you're a fan of Fixer Upper you may notice even farmhouse is getting a modern makeover. This dining room still has all the farmhouse elements-rustic furniture, words on the wall, shiplap and a rustic piece on the wall with peeling paint. The lighting is very current. The black and white contrast is definitely edgy. There's also a minimalism to this room. 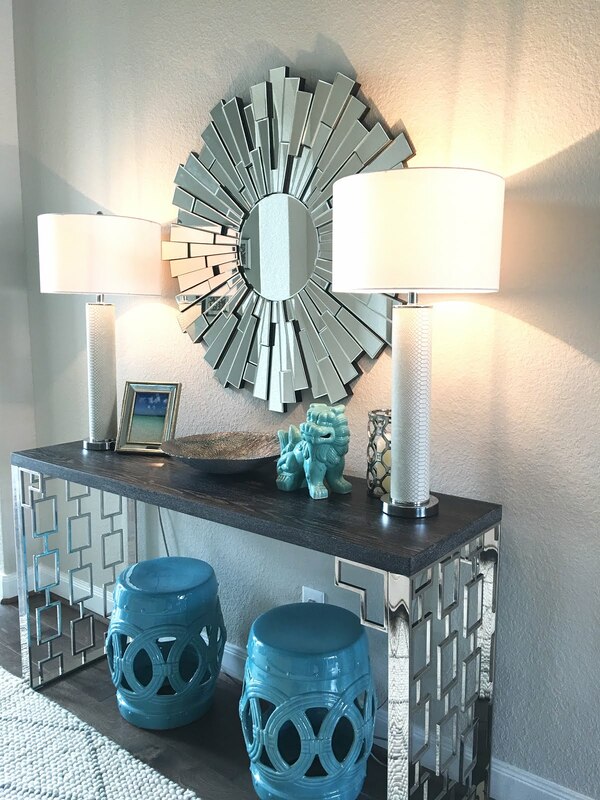 To get this look without changing too much of your current farmhouse decor streamline a bit by taking a few signs off the wall or minimizing your accessories. Consider modern fixtures that could still be considered farmhouse through lighting or cabinet hardware. As much as I love contemporary decor I also love traditional furniture pieces that will never go out of style. However, I do not like an overload of the senses. That means I will not pair ornate with ornate. Too much detail on every piece in a room is overwhelming. It also feels like you just walked into your Great Aunt Myrna's house. Keep that French chair, but add a modern pillow instead of a fringed one. You can see below I did this with my foyer bench. I even added an abstract art piece above it. Keep your sense of style, but update it with your favorite current accessories. We all know that brass and everything gold is back. The only problem is I am seeing way too much of it. Use it sparingly. I recently noticed a room makeover that was pretty, but every single fixture had a gold tone to it. It was way too overpowering. Mix your metals or try to use a little less sparkle. I have to admit I am drawn to everything sparkly myself when I'm out shopping. I have made a promise to myself that I am not bringing any more of it home. I have made huge sighs as I put back another mirrored tray or gold vase on the shelf. Check my coffee table above to see how it's gotten out of control. I would not be surprised to see less glam overall. I've already noticed a return of natural elements and boho. I really believe it's a response to gold metal mania. As I mentioned above I am seeing a return of more natural elements. This can go really wrong in a hot second. There's a fine line between a modern interpretation of the good things from these eras and The Brady Bunch house. Here it is done right. I know I just finished telling you that light and bright is still in. It is! I do think there are specific rooms we want to be cozy. I went this route in my husband's study. It's still unfinished, but you get the idea. Gray will still continue to be in, but not as the only color in the room. Pairing it with with the brown rug gives it depth. There will also be colorful artwork behind the desk when it comes in. I will be bringing out the green in other accessories. This is my quick mock-up using the Pic Collage app on my phone. I do this is all the time to see how something will look in a room. It only takes about a minute, which is great when you're standing in the aisle of a store. It's still gray, but not just gray and white. There's also gold, but it doesn't look like Napoleon's Apartments. You can see the design is more contemporary, but that wainscoting is never going to go out of style! I pretty much just incorporated everything I mentioned previously in this one room with the exception of boho/mid-century modern and farmhouse. That's just honestly not my style unless I were to move to Palm Springs or an actual farmhouse. I would happily move to Palm Springs! I just pictured myself lounging by the pool in a Trina Turk wardrobe. What Home Trends I Would Like to See? I am pretty much art obsessed these days. It is something personal and sets your home apart from everyone else, yet I rarely see it in most homes. I don't care what people choose as long as it something they love and not chosen from the aisle at Target because it fits the size of their wall. Scale and color are important, but not the only thing to consider. I will not be buying original art any time soon because of the cost. Yes, I can buy original art in my budget, but frankly it's not very good. I would much rather have a giclee that I love than bragging rights over an original art piece that doesn't interest me. I almost edited those last few sentences out because they sound a little harsh. I just can't seem to word it any other way. It's something I'm passionate about! You've seen the art in my home, but here is one I would really love to own as well. It's out of my budget, too! 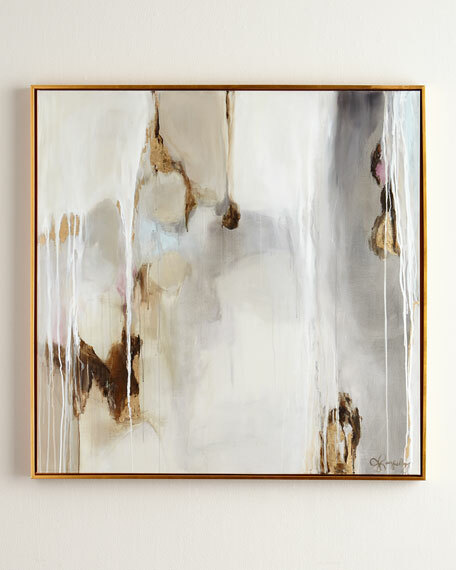 I usually buy my art at ZGallerie (when there's a discount of course) or High Fashion Home. HFH does have a website, but the art is 50% off if you visit the store in Houston to purchase or call the store directly. You've heard me mention this for years! Most of the rooms we love, like on Instagram and pin to our boards are not even about the decor. It's about the architecture of a room. 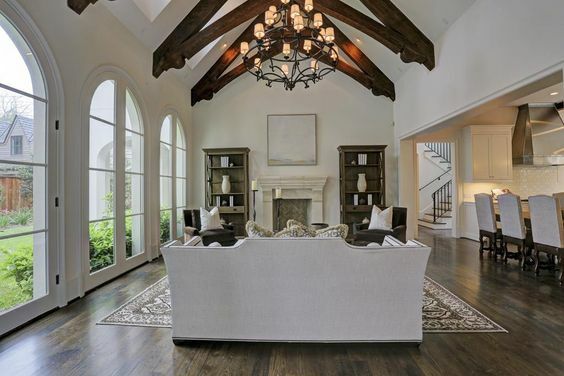 I want to see wood ceilings, wood or iron windows and doors (none of the aluminum we have here in Houston), wainscoting, etc. Some of these features are expensive, but some are not. Search my "DIY" label on many of the projects I did in my last house that were very affordable. I absolutely love custom drapery, but it is very expensive. I could write a separate post about drapes so I'll try and keep it short. You have seen me DIY my own drapes to make them look custom, but it has not been easy. It only works on certain windows as well. I would like to see pre-made drapery with pinch pleats. If they came in extra-wide lengths that would even by better! You can buy patio door drapes that are wider, but I've only found them in short lengths. Longer lengths, too! I would also like to see drapes pre-made with trim. I DIY'd mine in the photo above, but wouldn't it be nice if they came this way already? I think what I would like to see is what many would like as well. It's why DIY blogs are so popular! If manufacturers and builders want to know what will be a hit they only have to turn to what people are trying to DIY. We do it because the product is not available or too expensive. I was ultra-opinionated today, and now I'd love to hear what you think!